Holy Trinity Seminary Library holds nearly 48,000 cataloged volumes as well as approximately 20,000 still lacking electronic bibliographic description. The library subscribes to roughly 50 current periodicals and, combined with the collection of periodicals in the Archive, has a significant historical collection relating to Russian Orthodoxy and the Russian emigration. The library serves the needs of the Seminary's faculty, students, and adjacent monastic brotherhood as well as the immediate Russian Orthodox community. About half the collection is Russian or Slavic, approximately half of which is considered unique, being made up of rare pre-revolutionary theological, historical, and philological titles as well as interwar émigré publications. 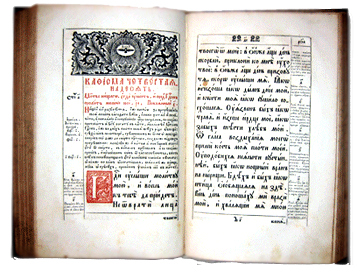 The library's collection concentrates on all areas of Slavic and Orthodox studies with particularly strong holdings in Russian and Russian Orthodox studies. Holy Trinity Seminary Library, located in the lower level of the Seminary building, is open to the general public for educational and research purposes. Application for access to the collections should be made to: library@hts.edu. Please become acquainted with the holdings at Holy Trinity via our catalog. Holy Trinity Seminary’s archive houses records pertaining to the Russian emigration and includes rare émigré periodicals, ecclesiastical documents, and personal papers dating to the time of the Russian revolution and the subsequent Civil War. In January 2009, Holy Trinity Seminary, together with the Hoover Institution of War and Peace, completed a nineteen-month long NEH sponsored preservation and microfilming project. For more information on this project, the archives holdings and to browse finding aids, click here. For a complete listing of periodicals housed in the archives, please press on the link provided below, which will allow you to browse the archive’s periodical database. Access by external researchers to all materials in the archives and to restricted materials in the library can be gained only through an on-site visit at this time. Generally, access to archival materials by external researchers is via microfilm. External researchers may submit an interlibrary loan (ILL) request for books in the library's regularly circulating collection. They should do so via the ILL service of their home institution. Books available for borrowing via ILL all appear in WorldCat. However, not all of Holy Trinity's books appearing in WorldCat can be sent via ILL. The best way to determine whether an ILL request for a book will be successful is to search Holy Trinity's local catalog. Only books with "Available" in the status field of the holdings line can be considered for sending via ILL. Click "More info" in the brief view of Holy Trinity's catalog record for the book in order to display this line. Presently, Holy Trinity does not have the capacity to respond to requests for copies from any of its collections. Requests for copies received via email or regular mail are generally not responded to. Holy Trinity does not yet have the ability to produce publication-level scans for external researchers and publishers. We hope to be able to provide these services in the future.